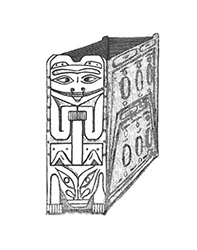 Sealaska Heritage Institute (SHI) has secured a grant from Museums Alaska to conserve an old Tlingit box drum and to make infrared scans to reveal the original formline design. The grant will allow SHI, with permission from the T’a̱kdeintaan Clan, Mt. Fairweather House, of Hoonah, to contract a professional conservator to perform a critical-condition assessment, do general cleaning and recommend conservation treatments, and to hire a photographer to make infrared scans on the sides of the large drum. In 1924, the drum was collected by Louis Shotridge for the University of Pennsylvania Museum of Archaeology and Anthropology. The T’a̱kdeintaan Mt. Fairweather House—in partnership with the Hoonah Indian Association, Huna Totem Corporation, Huna Heritage Foundation, Sealaska and SHI—in the late 1990s launched a vigorous campaign to repatriate the drum and nearly 50 other items housed at the museum. The parties argued before the Native American Graves and Repatriation Act (NAGPRA) Review Committee in 2010 that the 1924 transaction was illegal because the T’akdeintaan Clan never agreed to alienate the objects. The committee sided with the Native groups, and in 2011, the museum returned eight of the pieces, including the box drum. The people of the T’a̱kdeintaan Mt. Fairweather House are still waiting for the rest of their objects, more than 20 years after first filing to repatriate their at.óowu (clan treasures). This project was made possible by a grant from the Collections Management Fund of Museums Alaska, with generous support from Rasmuson Foundation. 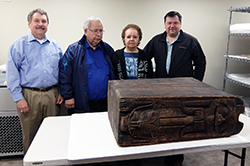 Captions: The box drum with SHI History and Culture Director Chuck Smythe, Ron Williams of the T’a̱kdeintaan Clan and his wife Julie, and Robert Starbard of the T’a̱kdeintaan Clan; drawing of the box drum made by author Aurel Krause that appeared in his book Die Tlinkit-Indianer: Ergebnisse Einer Reise Nach Der Nordwestküste Von Amerika Und Der Beringstrasse.